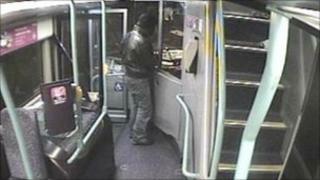 A Bristol bus driver was treated in hospital for a hand injury after a man threatened him with a knife. Police said the driver was hurt in the robbery on Whitefield Road in Speedwell on Wednesday at 1730 GMT. Officers said the incident may be linked to a similar robbery on Tuesday in Westbury-on-Trym and two incidents in Henbury in October. The attacker is described as 6ft tall, white and either medium or slim build wearing dark clothing. In October, First Bus suspended evening services in Henbury for more than two months after drivers were threatened and robbed. Karen Baxter, from First Bus, said: "We are deeply concerned about the nature of these attacks on our drivers and as such we are working closely with the police to catch those responsible. "Our staff carry very little money on them - and steps are being taken to reduce this further."